ScrapFIT - use shapes you normally don't see in a LO and use fall colors. To meet the challenge requirements I used photos that actually include hexagon shapes (how perfect was that? 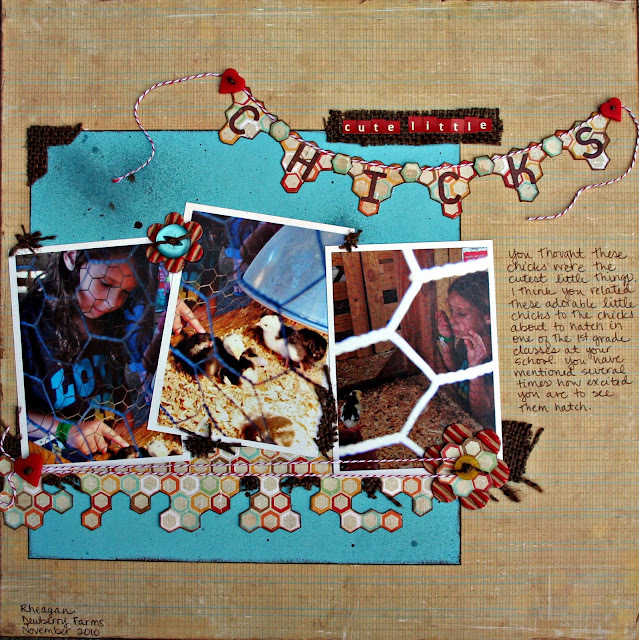 ), plus burlap and then I fussy cut hexagons from paper from the Scrapbook Circle November kit. I love the paper and embellishments combos that Lisa puts together. And the sketch was just the inspiration I needed to put it all together!! I love the way you cut out the hexagon pp -- and the photo through the wire is a great shot! I love how cut up this paper !!! the banner is so cute!! Agreed! Very creative with that paper. The little burlap accents are cute. Very creative, and thanks for playing! Beautiful! Love how you cut up those fab papers! Those photo's are beautiful! Love your take on the sketch! Love how you used the Crate here, great design! Thanks for joining the fun at Sketchy Thursdays this week!! The hexagon paper is perfect - looks just like the cages. Pure love!!!! Super cute LO! I just love how you cut the PP and used the burlap! Great job!!! BoBunny Challenge & Hippity Blog Hoppin' Time!